I have a new batch of sauerkraut that will be ready next week, probably Thursday. Easy Peasy method: just shred cabbage on a mandolin, add salt (3 Tbsp per 5 pounds of cabbage), bruise the salted cabbage with your hands and pack it really, really tight into a jar. You want the juice to float above the cabbage at least 1 inch. Place another jar inside to hold the cabbage under the juice…or use giant glass marbles (sterilized of-course). Set it on your counter on a plate with a tea-towel covering. 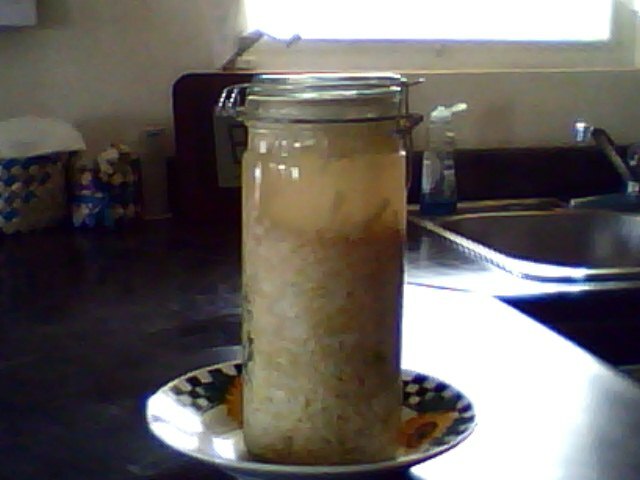 Wait 10 or 12 days and voila, old world “sauerkraut”! Refrigerate to stop fermenting. Will keep in frig up to a month or longer. You can add Juniper berries to the fermenting cabbage for a real old-world flavor. Once the sauerkraut is ready, cook up some sauerbraten and add to a pot of hot sauerkraut cooked with chunks of apple and a teaspoon of caraway or fennel seeds. Serve with mashed potatoes and homemade Dijon mustard.